Statements to Where the General Was During the Charge.--Why the Attack Failed. The following statement of what I saw and heard on the third day at Gettysburg was in the main written about thirty years ago, and was rewritten for publication in 1903, but the issue of it was prevented until now by an attack of gout, from which I suffered. I earnestly wish that it had come out before the death of my corps commander, the brave General Longstreet. Early in the morning Pickett's Virginians, forty-seven hundred muskets, with officers added, five thousand strong, moved from the camping ground of the second day, two miles in rear, to the battlefield, and took position behind the hill from which we charged later in the day. Then came the order from headquarters: "Colonel E. P. Alexander will command the entire artillery in action to-day, and Brigadier-General Pendleton will have charge of the reserve artillery ammunition of the army." Later, General Pickett was informed from General Longstreet's headquarters that Colonel Alexander would give the order when the charge should begin. Several hours later the batteries on both sides opened. Had this occurred at night, it would have delighted the eye more than any fire works ever seen. Shortly before the artillery duel commenced, I returned from looking over the ground in our front, and found General Pickett talking to a strange officer, to whom he introduced me saying: "This is Colonel Gordon, once opposed to me in the San Juan affair, but now on our side." In explanation of this I will state here that the San Juan affair occurred on the Pacific coast when General Pickett was captain in the United States army, and when he held the island against three English ships of war and 1,000 English regulars, he having one company of United States infantry and part of another company. General Winfield Scott was sent out by this government to settle the trouble. "Pickett, my men are not going up to-day." "But, Gordon, they must go up; you must make them go up." "You know, Pickett, I will go as far with you as any other man, if only for old acquaintance sake, but my men have until lately been down at the seashore, only under the fire of heavy guns from ships, but for the last day or two they have lost heavily under infantry fire and are very sore, and they will not go up to-day." This officer was on foot, there was no horse in sight, and he must have come from Pettigrew's Brigade on our left, only some 200 yards distant. I have written and asked about the command to which this officer belonged, but have met with no success. "You and your staff and field officers to go in dismounted; dress on Garnett and take the red barn for your objective point." During the charge I found Kemper and Garnett apparently drifting too much to the left, and I believe it was because the red barn was too much to Kemper's left. General Pickett would have altered the direction, but our left being exposed by the retreat of Pettigrew's command, our men and 10,000 more were needed to the left. When I reached General Kemper, he stood up, removing a handkerchief from under his hat, with which he had covered his face to keep the gravel knocked up by the fierce artillery fire from his eyes. As I gave the order, Robert McCandlish Jones, a friend and schoolmate of mine, called out: "Bob, turn us loose and we will take them." Then Colonel Lewis Williams, of the 1st Virginia Regiment, came to me and said: "Captain Bright, I wish to ride my mare up," and I answered: "Colonel Williams, you cannot do it. Have you not just heard me give the order to your general to go up on foot?" and he said: "But you will let me ride; I am sick to-day, and besides that, remember Williamsburg." Now Williamsburg was my home and I remembered that Colonel Williams had been shot through the shoulder in that battle and left at Mrs. Judge Tucker's house on the courthouse green. This I had heard, for I missed that fight, so I answered: "Mount your mare and I will make an excuse for you." General Garnett had been injured by a kick while passing through the wagon train at night, had been allowed to ride; Colonel Hunton of the same brigade also rode, being unable to walk. He fell on one side of the red barn and General Kemper on the other side. So there were eight mounted officers, counting General Pickett and staff, mounted in the charge. Colonel Williams fell earlier in the fight. His mare went up rideless almost to the stone wall and was caught when walking back by Captain William C. Marshall, of Dearing's Battalion. His own horse, Lee, having been killed, he rode Colonel Williams' mare away after the fight. When I returned to General Pickett from giving the order to General Kemper, Symington, Baird and Charles Pickett were with the General, they having less distance to carry their orders than I, as Kemper was on our right, and Armistead not in first line, but in echelon. The command had moved about fifty yards in the charge. 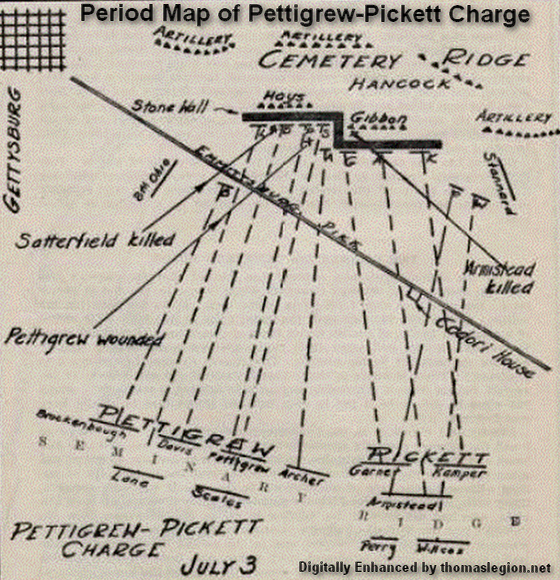 General Pickett and staff were about twenty yards in rear of the column. When we had gone about four hundred yards the General said: "Captain, you have lost your spurs to-day, instead of gaining them." Riding on the right side, I looked at once at my left boot, and saw that the shank of my spur had been mashed around and the rowel was looking towards the front, the work of a piece of shell, I suppose, but that was the first I knew of it. Then I remembered the Irishman's remark, that one spur was enough, because if one side of your horse went, the other would be sure to go. When we had charged about 750 yards, having about 500 more to get over before reaching the stone wall, Pettigrew's Brigade broke all to pieces and left the field in great disorder. At this time we were mostly under a fierce artillery fire; the heaviest musketry fire came farther on. General Pettigrew was in command that day of a division and his brigade was led by Colonel Marshall, who was knocked from his horse by a piece of shell as his men broke, but he had himself lifted on his horse, and when his men refused to follow him up, he asked that his horse be turned to the front. Then he rode up until. he was killed. If all the men on Pickett's left had gone on like Marshall, history would have been written another way. General Pickett sent Captain Symington and Captain Baird to rally these men. They did all that brave officers could do, but could not stop the stampede. 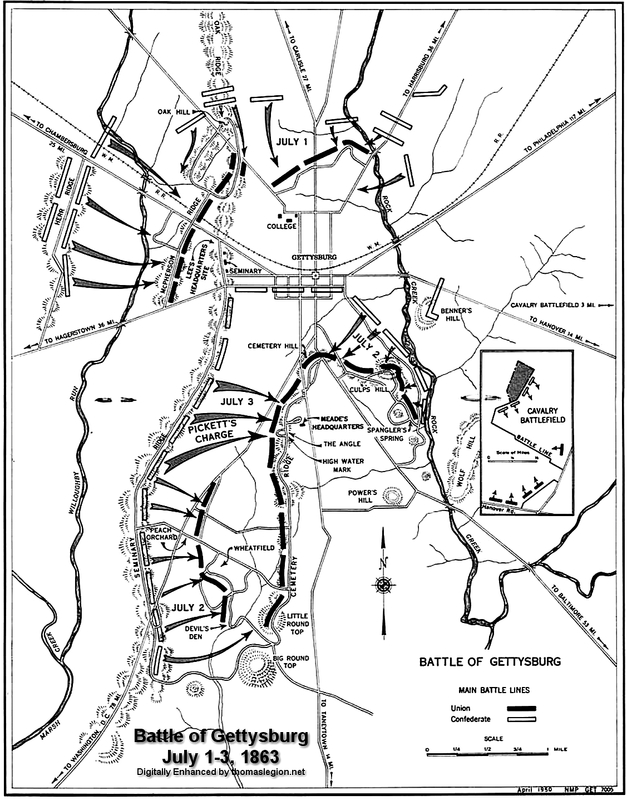 General Pickett directed me to ride to General Longstreet and say that the position against which he had been sent would be taken, but he could not hold it unless reinforcements be sent to him. As I rode back to General Longstreet I passed small parties of Pettigrew's command going to the rear; presently I came to quite a large squad, and, very foolishly, for I was burning precious time, I halted them, and asked if they would not go up and help those gallant men now charging behind us. Then I added, "What are you running for?" and one of them, looking up at me with much surprise depicted on his face, said. "Why, good gracious, Captain, ain't you running yourself?" Up to the present time I have not answered that question, but will now say, appearances were against me. I found General Longstreet sitting on a fence alone; the fence ran in the direction we were charging. Pickett's column had passed over the hill on our side of the Emmettsburg road, and could not then be seen. I delivered the message as sent by General Pickett. General Longstreet said: "Where are the troops that were placed on your flank?" and I answered: "Look over your shoulder and you will see them." He looked and saw the broken fragments. Just then an officer rode at half-speed, drawing up his horse in front of the General, and saying: "General Longstreet, General Lee sent me here, and said you would place me in a position to see this magnificent charge. I would not have missed it for the world." General Longstreet answered: "I would, Colonel Freemantle, the charge is over. Captain Bright, ride to General Pickett, and tell hin what you have heard me say to Colonel Freemantle." 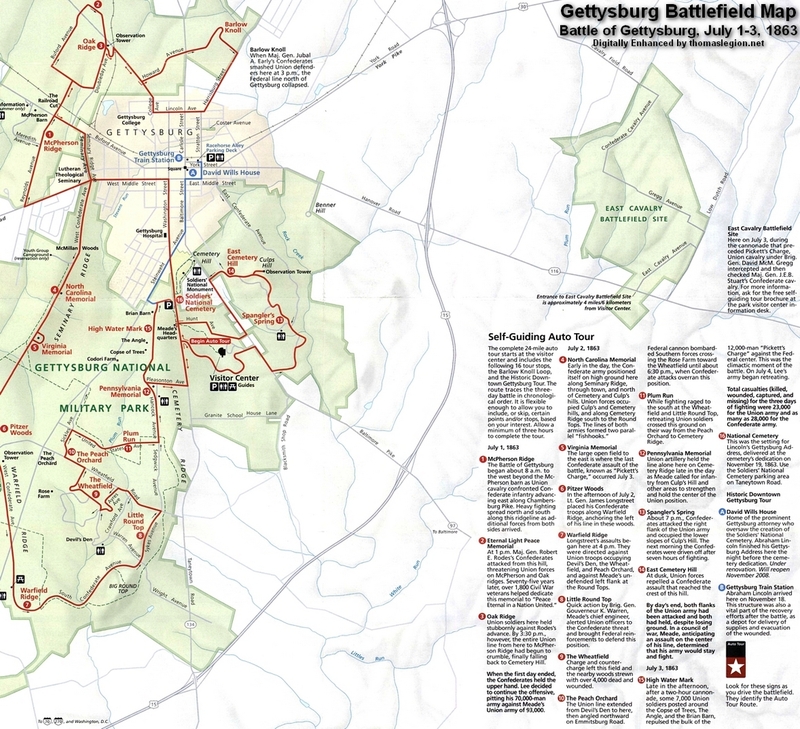 At this moment our men were near to but had not crossed the Emmettsburg road. I started and when my horse had made two leaps, General Longstreet called: "Captain Bright!" I checked my horse, and turned half around in my saddle to hear, and this was what he said: "Tell General Pickett that Wilcox's Brigade is in that peach orchard (pointing), and he can order him to his assistance." Some have claimed that Wilcox was put in the charge at its commencement--General Gordon says this; but this is a mistake. When I reached General Pickett he was at least one hundred yards behind the division, having been detained in a position from which he could watch and care for his left flank. He at once sent Captain Baird to General Wilcox with the order for him to come in; then he sent Captain Symington with the same order, in a very few moments, and last he said: "Captain Bright, you go,' and I was about the same distance behind Symington that he was behind Baird. The fire was so dreadful at this time that I believe that General Pickett thought not more than one out of the three sent would reach General Wilcox. When I rode up to Wilcox he was standing with both hands raised waving and saying to me, "I know, I know." I said, "But, General, I must deliver my message." After doing this I rode out of the peach orchard, going forward where General Pickett was watching his left. Looking that way myself, I saw moving out of the enemy's line of battle, in head of column, a large force; having nothing in their front, they came around our flank as described above. Had our left not deserted us these men would have hesitated to move in head of column, confronted by a line of battle. When I reached General Pickett I found him too far down towards the Ennmettshurg road to see these flanking troops, and he asked of me the number. I remember answering 7,000, but this proved an over estimate. Some of our men had been faced to meet this new danger, and so doing somewhat broke the force of our charge on the left. Probably men of the 1st Virginia will remember this. I advised the General to withdraw his command before these troops got down far enough to left face, come into line of battle, sweep around our flank and shut us up. He said, "I have been watching my left all the time, expecting this, but it is provided for. Ride to Dearing's Battalion; they have orders to follow up the charge and keep their caissons filled; order them to open with every gun and break that column and keep it broken." The first officer I saw on reaching the battalion was Captain William C. Marshall (Post office, Morgantown, West Virginia). I gave him the order with direction to pass it down at once to the other three batteries. Marshall said: "The battalion has no ammunition. I have only three solid shot." I then asked why orders to keep caissons filled had not been obeyed, and he answered, "The caissons had been away nearly three-quarters of an hour, and there was a rumor that General Pendleton had sent the reserve artillery ammunition more than a mile in rear of the field." I directed him to open with his solid shot, but I knew all hope of halting the column was over, because solid shot do not halt columns. The second shot struck the head of column, the other two missed, and the guns were silent. I found General Pickett in front about 300 yards ahead of the artillery position, and to the left of it, and some 200 yards behind the command which was then at the stone wall over which some of our men were going, that is, the 53rd Regiment, part of Armistead's Brigade, led by Colonel Rawley Martin, who fell next to the gallant General Armistead, had reached the enemy's guns and captured them. All along the stone wall, as far as they extended, Kemper and Garnett's men were fighting with but few officers left. I informed the General that no help was to be expected from the artillery, but the enemy were closing around us, and nothing could now save his command. He had remained behind to watch and protect that left, to put in first help expected from infantry supports, then to break the troops which came around his flank with the artillery; all had failed. At this moment our left (Pickett's Division) began to crumble and soon all that was left came slowly back, 5,000 in the morning, 1,600 were put in camp that night, 3,400 killed, wounded and missing. We moved back, and when General Pickett and I were about 300 yards from the position from which the charge had started, General Robert E. Lee, the Peerless, alone, on Traveler, rode up and said: "General Pickett, place your division in rear of this hill, and be ready to repel the advance of the enemy should they follow up their advantage." (I never heard General Lee call them the enemy before; it was always those or these people). General Pickett, with his head on his breast, said: "General Lee, I have no division now, Armistead is down, Garnett is down, and Kemper is mortally wounded." Then turning to me, General Lee said: Captain, what officer is that they are bearing off?" I answered, "General Kemper," and General Lee said: "I must speak to him," and moved Traveler towards the litter. I moved my horse along with his, but General Pickett did not go with us. The four bearers, seeing it was General Lee, halted, and General Kemper, feeling the halt, opened his eyes. General Lee said: "General Kemper, I hope you are not very seriously wounded." "Yes, General Lee, do full justice to this division for its work to-day." General Lee bowed his head, and said: "I will." I wish to mention here that Captain William I. Clopton, now judge of Manchester, told me after the war that while General Pickett was trying to guard his left, he saw twenty-seven battleflags, each with the usual complement of men, move out on our right flank, but we did not see this, as all our thoughts were fixed on our left flank. Captain Symington and Captain Baird could each give many interesting incidents if they could be induced to write for publication. My article of the 10th of December, 1903, in The Times-Dispatch, should be read before this account, to show how and when General Pickett's command reached Gettysburg. Should I write again, it will be about the 4,000 prisoners we guarded back to Virginia, Kemper's supposed death bed, and General Lee's note to Pickett a few days after Gettysburg. To those seeking the truth about this great battle, I will say, the very great losses in other commands occurred on the first and second days. The third day, at this exhibition, was most decidedly Virginia day, and a future Virginia Governor, Kemper by name, was present. I wish here to state that some of the men of Garnett's Brigade told me they saw up at the stone wall, fighting with them, some men and officers, mostly the latter, of two other States, and in answer to my questions as to numbers and organization, answered, numbering in all, less than sixty, and without formation of any military kind, Alabamians and North Carolinians. Now, as to the position of Armistead's Brigade in the charge. He was ordered to go in on the left of Garnett, but Captain Winfree, a most gallant officer of the 14th Virginia, now living in this city, agrees with my memory, that Armistead's brigade went in between Garnett and Kemper. I also wish to give such information as I can to Senator Daniel, who asked for it in the Confederate column of Sunday's Times-Dispatch, 24th of January, about the losses of Pickett's three brigades on the third day. No official returns came to us until long after the battle, because no one was left to make the report, and hardly any one was left to receive such report. General Pickett's staff officers who encamped the command on the night of the third day counted sixteen hundred. I find Senator Daniel since the war always turning from Washington to Virginia, like the needle to the pole, but, strange to say, during the war I found him always turning from Virginia to Washington as though he wanted that city. Formerly on the staff of Major-General George E. Pickett.